Igloo model was made by an unknown Inuit artist sometime before 1939. It's made of whale ivory, pegged together. You can peer through the window (that in a traditional snow-dome igloo would be made of translucent seal gut) or take the model apart to see how benches, storage and other features of the inside were arranged. See Royal Ontario Museum record and larger photo. In Thule, the northeastern shore of Greenland, where the Inuit small community was isolated from everyone, and believed themselves the only people in the world until the beginning of the 19th century, large snow domes were built as singing, dancing, and wrestling competition halls for the community during the long night of winter. This one photographed in northern Canada is a braced reconstruction, with many skylights, such as the Thule Inuits' large multiple snow dome community halls had. Famed Baffin Island Inuit artist Kenojuak designed the great seal for Nunavut, the Canadian Arctic province that is to come into existence as a settlement of western and central Canadian Inuit land claims. Her design shows land circling the icy sea of the north pole, with several kinds of igloos arranged around, including temporary hunters' domes out on the frozen winter sea. Photographed in the early 1900's by Canadian anthro Diamond Jenness, hunters' igloos are shown foreground and at the edge of the shore's frozen ice. 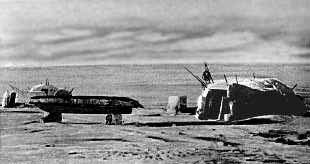 Spearpoints and harpoons are planted in the walls, and at left a dogsled has been turned upside down, raised on snow blocks. Martin Frobisher's 1576-78 expedition to Baffin Island in the Canadian Arctic made this engraving of an Inuit igloo village. Notice the windows all facing toward where they will get the most light. When it is winter, above the Arctic Circle, the sun never rises for 3 months, light is by stars, moon, aurorae. Notice how sleds and kayaks are hung up, so as to keep them from freezing to the ice. Frobisher's party killed some Inuit, kidnapped one Inuk man who was exhibited in London like an animal. Here's how Jenness describes making an igloo: "After the key block has been inserted the hut is tightly sealed and a lamp is kindled inside. The heated air, having no exit, begins to melt the face of the snow blocks, which rapidly congreals again on admission of cold air from the outside. Ths each snow block is firmly cemented in place and converted to ice on its inner face. Occupation for a few days then gradually changes the interiors of the blocks, so that the structure is no longer a snow house but a house of ice. The transformation gives it remarkable stability; a man can stand on the summit without causing collapse, and half the hosue cna be destroyed without destroying the other half. Consequently by building a serioes orf intersecting domes and omitting or opening up the common segments, an Eskimo can enlarge a small circular hut capable of housing only 1 or 2 families into a community dwelling of 3, 4 or 5 rooms that will house 15 or 20 people." "Glance for a moment at the interor of an ordinary, single-room snow hut. You pass with bowed head along a narrow, roofed passage of snow blocks until you arrive at the doorway, a hole at your feet, which you traverse on hands and knees. You rise to your fee. On the right (or left) two feet above the floor is the lamp, a saucer-shaped vessel of stone, filled with burning seal-oil, and with a stone cooking pot suspended above it. Behind the lamp are some bags containing meat and blubber; in front of it, a wooden table bearing perhaps a knife and a ladle. A low platform covered with skins occupies fully half the floor space. There, side by side with their heads facing the door, the inmates sleep in bags or robes of caribou fur. If you stand at the edge of this platform, exactly in the centre of the hut, you can place both hands on the celing and almost touch the wall on either side. A thermometer three feet from the lamp, will register one or 2 degrees below the freezing point of water quite a comfortable temperature if you are enveloped like the Eskimo in soft, warm garments of caribou fur. " Diamond Jenness, The Indians of Canada,University of Toronto Press, 7th ed., 1993 reprint. Building An Igloo, How2 illustrated -- shows the method of constructing a small, simple igloo of compressed snow blocks. There's not much mention of the lamp seasoning , a week to a month of melting and refreezing, which gave the real igloos their great physical strength by turning the snow blocks to ice from the inside out. The method also shows the snow blocks simply laid around in a circle on the surface. So this is a very simple igloo, that single hunter or small group might build far out on the winter sea ice. for temporary shelter. Snow dome winter homes were built only in the Central Canadian Arctic and at Thule in Greenland. On the southern and eastern Greenlandic shores, and in most of the western Arctic (and Siberian Arctic), houses were dugouts braced with whalebone and rocks (because wood was so scarce and valuable). Braced roof, covered with thick walrus hides, then dirt, then snow served as winter insulation. These homes collapsed in the spring melt and were built anew, often in different places, each winter. Except in eastern Greenland, most were single, but multi-family homes were not shared every winter by the same clan or group. People decided who they would live with the following winter during the summer hunt. Winter settlement communities were transient and changing. Probably during the long night and fierce storms, the same people in close contact became boring or irritating. Something conducive to forming new winter communities was the traditional method of litigation. Lawsuits were carried out by aggrieved parties by singing contests 9with a little head-bumping), in which outrageous verses about the each party were sung in contest by the litigants. The wittier the better, for audience ratings of the lawsuit's progress -- and outrageous verses often involved some in the audience, too. Some were slanderous, but the truthful ones made some in the audience hang their heads, while others laughed softly. In time, for these lawsuits continued for years, decades, the litigants began to sing re-runs -- still entertaining to new winter audiences, of course. Sure beats reading legal briefs, or TV soap operas.. Note: "Eskimo" is an eastern Ojibwe or Algonquian word meaning 'those who eat their meat raw.' Inuit means "We people." . The Inuit ate about half their meat raw, because for both light and heat in the winter months there were only stone lamps filled with rendered sea mammal fats, no fuel for much cooking. However, the raw meats and fish were far more nourishing than if they had been cooked. 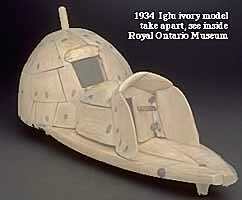 CREDITS:Inuit-made model of igloo, from Royal Ontario Museum Schoolnet exhibit of Native items from the ROM. Photo of large igloo from some Northwest Territories tourist service not recorded. Kenojuak great seal of Nunavut from Nunavut Impelementation Commission final report cover. 1905 photo of ice hunter igloos from Diamond Jenness's book. 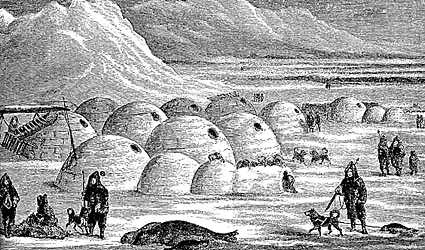 Engraving of Inuit igloo village (Frobisher expedition) from 500 Nations, ed. Alvin M. Josephy Jr., Knopf, 1994. Whalebone-rock dome house diagrams, Harold E. Driver, Indians of North America, 2nd Ed., University of Chicago Press, 1968.